Just wanted to take a minute to tell you how wonderful our stay was in Maui and your condo played a big part in making our vacation special. We LOVED the lanai, it was even more breathtaking than in your photos on your VRBO listing. I sent a review to VRBO praising your condo :-) I also wanted to mention a couple things from our stay just for your info. We ran out of toilet paper so had to buy more and couldn't find any extra bars of soap either. I also bought a new bag of coffee because the one you had was one hard block. Other than these minor items, we loved your condo and it was great you had so many games available and all the snorkeling gear, etc. We stayed here for 5 nights, and the condo was perfect for us. Pros: The views are amazing! Location is great - a Safeway is around the corner to get essentials, there are a handful of very good restaurants within walking distance, and you are close to Front Street but not right on it (maybe a 3 minute drive). There is a nice pool, the condo itself was spacious for 2 of us and had all the essentials in the kitchen, bathroom and laundry room. Also, there are plenty of great beach items (boogie boards, chairs, coolers, beach towels, etc. ), board games, and extra blankets and pillows. Some cons: Since there is no AC (to be expected) the condo gets pretty warm if you don't draw the shades during the day, street/hall noise comes into the bedroom (there are signs outside that ask you to keep noise to a minimum at night), and the king bed are two twins pushed together (not so good if you sleep in the middle of the bed). All in all, there is nothing so major that is a deal-breaker, and we would definitely come back! A wonderfully relaxing condo/apartment. Spacious and very accommodating with the bathroom separating the bedroom from the living room and kitchen. The lanai allowed for many evenings of watching the glorious sunsets and the sound of the waves were the relaxing tonic we needed. One was so close to the ocean, one could toss a football into the ocean (though we did not). We utilized the condo to the max, but alas, no time for the pool or the barbeque - next time. The accommodation was exactly as described/pictured and the resident manager was extremely helpful and prompt with service. Our ceiling fan in the living room would not work when we arrived and the manager returned within minutes with a new battery for the remote. Wonderfully friendly and very helpful with all our concerns and questions about where to snorkel and some of the places we could visit, particularly the Road to Hana which we did take - a full-day trip and then some!! We also enjoyed Bubba Gumps for a 'fun dinner' and walking through all the shops in town. Thank you for a lovely stay. We shall return soon. Lahaina Roads 409 was everything the Bucks promised. My jaw dropped when I saw how close we were to the Pacific ocean! We spent much of our condo time on the lanai watching the surf, the turtles popping their heads up and the boats in the harbor. The location couldn't be better, close to stores and beaches. The unit is comfortable with all amenities for a long stay. The complex is beautifully maintained. Cheryl, their resident rep, was wonderful, very helpful with our questions about Lahaina and Maui. She even delivered roses to our door to make our anniversary even more special! Thanks so much, we will be back. 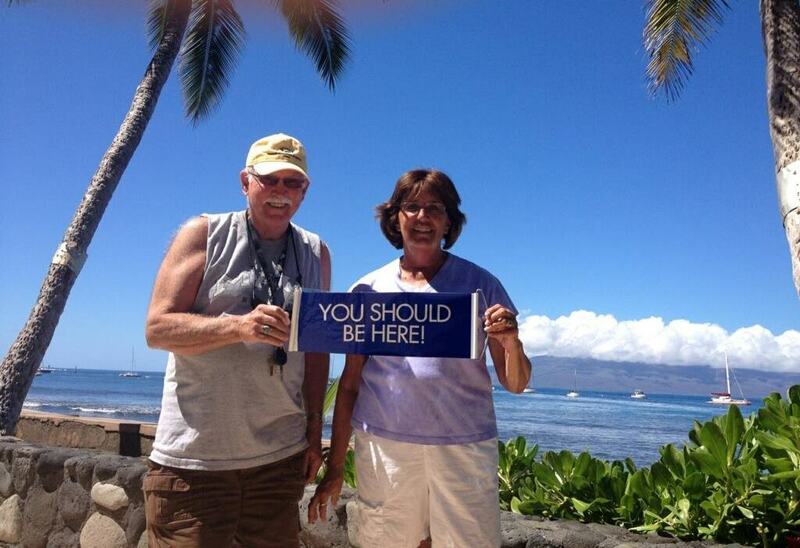 Our family and friends had a great time in Lahaina. Our condo was located in a perfect spot. Within a few blocks of the Lahaina Mall and 1 mile from the tourists shops and popular restaurants. All within walking distance. Our condo was nice and clean and the manager was accommodating. Our condo was equipped with all the amenities, including WiFi. The view of the pool and ocean were spectacular. The mixture of friendly locals and tropical weather made it extremely difficult to leave. If fact, it was the only vacation I've been on where I was not looking forward to coming back home. Wish I were still there. I wouldn't want to stay at any other place on the island. I LOVE this condo!!!! The view is A--MAZING!!! My husband and I put on our water shoes and ventured out into the water from the pool stairway into the ocean. We saw sea urchin, pink crabs, and a sea turtle. The sunsets from the condo are gorgeous. Sitting out on the lanai is something out of a movie. We rented the condo in the middle of summer (June) and there was NEVER any need for air conditioning. The whole island is without air conditioning and it is SO PLEASANT!!! There is a breeze that comes in off the ocean through the lanai and goes all the way back to the bedroom. There are also plenty of fans to help keep the air moving. The on-island manager is Cheryl and she is awesome! She came to visit us and asked us if we had any questions about the condo. We had one issue trying to figure out how to turn on the fan in the living room. She quickly found out for us and helped us turn it on. She was so nice. She also asked us about our vacation plans and what we planned to do while we were on island. She also gave us recommendations. She was super nice. This is a fantastic condo. I recommend it over any of the "fancy" hotels in Ka'anapali. This is the authentic Hawaii that the locals would enjoy. Oh, and right above our condo in a penthouse is a local who blows his conch three times and says "Aloha" every evening right at sunset. The first time I heard it, I was surprised until I realized where it was coming from. Now, I look forward to it. :) Enjoy your stay at Lahaina Roads #409!!! We were very pleased with this condo. Pictures are just as the place is like. Place has everything you need well stocked kitchen with George Forman grill, morning newspaper, and wifi. Owners are very helpful and work with you while making all arrangements. P lace is well kept as is the outside of the property. Sunsets are something only God could arrange they are without a doubt the most beautiful we have ever seen. Safeway food market is within walking distance as is Walgreen and other places to eat and shop. Warren and Anabelle comedy magic show a must see. We have seen the whales straight out in the water. A whale watching boat trip is a must also. If you are use to sailing a trip out on the America Cup boat is something you will enjoy. Plan on getting wet it is the real deal. If you are not here for a long time we would recommend you not use a whole day for a drive to Hana, plus it is a very hectic SMALL road to travel. For a vacation of plenty of R&R, as is what we came for, this is the place to stay. Quiet and out of the way, mornings if you are a light sleeper you may hear the morning traffic but it really didn't bother us. THANKS JUDY AND WAYNE! very nice location and condo building. Great access to Lahaina and the NW part of the island. Well maintained building and unit. Enjoyed the dishwasher and the in-unit laundry. Very quiet , few children. Wonderful view. Would recommend staying here and hope to return. Live like Locals on Vacation! What a treat to get to stay at this sweet condo! It was a perfect size for our family of four! We could walk to nearby restaurants, had reserved parking, and were just minutes from town, beaches, shopping, and great food! The best part is the location. You cannot get ANY closer to the ocean, unless you were on a boat! While our friends stayed in condos that had no ocean view, or just a partial view, our entire view was ocean! We even had our own turtle family right outside! Since we kept the windows open to catch the breeze, we realized (with delight) that we had to actually raise our voices over the sound of the crashing waves! Paradise! The kitchen is well equipped, and had everything we needed. With 2 kids, I'm so happy we had the washer and dryer! It saved us! Any time we wanted to swim, we practically had the pool to ourselves as well as the BBQ! We will definitely return to Lahaina Roads, where we lived like locals on vacation! submit your review - mahalo! Please give us your open and honest feedback to our condo, Lahaina Roads #409. We really appreciate your feedback and our future guests do as well. Mahalo!